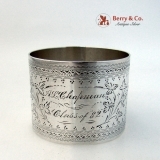 American coin silver Aesthetic napkin ring having foliate engravings surrounding a central inscription: A. L. Chapman Class of ′82. This interestingly attractive napkin ring is 1 3/4" in diameter, 1 1/2" tall and weighs 44 grams or 1.4 ozs. Troy. Inscribed as described above, the soft, warm, original finish is present, with no buffing or machine polishing. The excellent original condition and clear detail, with no removals, repairs or alterations, make this an especially attractive offering.